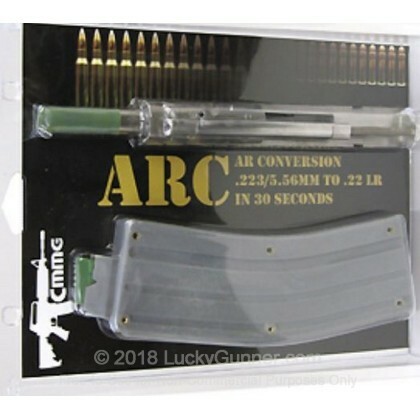 This Drop-in .22 LR conversion kit comes fully assembled and ready to install in any semi-auto AR-15 to help you practice your shooting skills with affordable .22 LR rimfire ammunition. This conversion kit will pay for itself after firing approximately 750 rounds of .22LR in place of your normal 223 rounds. This will enhance your shooting skill with cheaper practice saving close to $.25/round fired! Simply remove your bolt carrier group and insert the conversion bolt and feed the .22 LR rounds with the included CMMG .22 LR Magazine. 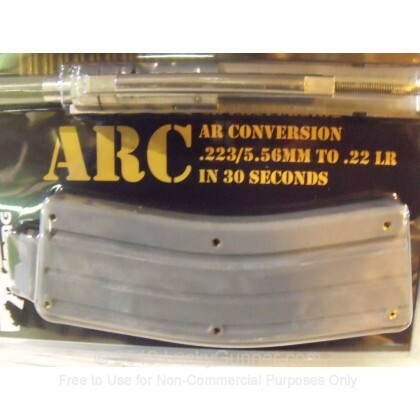 This conversion takes less than a minute with no permanent alterations to your firearm. It can quickly and easily be returned to its original caliber. . . . and the best part is that it is STAINLESS STEEL and very easy to clean! Note: This kit is designed for Right-Handed AR-15's only. This kit comes with one 25 round magazine included. Great product, allows cheap plinking. I have a Colt 6940 and purchased the CMMG kit that came with 2 black mags. These would not go into receiver without some filing down. Called CMMG and they replaced with their grey mags (no questions asked). Fit like a glove!! I gave 5 stars to the performance and value of the CMMG product because it does work fantastic in it's dedicated .22 set up. I originally got the AR-15 drop in kit (stainless steel), which totally failed after 115 rounds. Thus the 1 star for quality. Lucky Gunner took care of the problem, no questions asked. Thank you Heidi and your team! I still wanted the economy of a .22 AR, so I ended up getting a CMMG dedicated upper. It's made for true .22 LR cycling & accuracy. After 1000+ rounds, no issues what so ever, and saving wear & tear on my Colt's 5.56 upper. The replacement CMMG bolt will go into an AR-22 I'm building for my girlfriend. The stainless steel is superior to the phosphated version as well. I want to again thank Heidi and her team. Their customer service is impeccable! Just got the kit today. I have an M4 upper that was defective. Got it from some cheap supplier. Nothing can fix it so I kept it for parts. So, I figured why not make it a dedicated 22lr conversion. I crimped the gas tube shut in a vice to stop gas pressure from leaving the brl. I inserted the CMMG kit that replaced the BCG. A bit of a tight fit into the 'gear' area, but it went in. Performance? Unreal. Ran like a Ferrari. All stainless steel parts with quality welding led to a 300rd break in with zero flaws. I ran Stingers, Remington round nose, hollow point and Winchester round nose and hollow point AND Blaser...zero feeding or ejection issues. Make no mistake, this is a quality product that will not let you down. I went to order another today and seen that they are out of stock! Glad I got the extra mag as well. If you want to shoot for cheap or teach your kids, this is THEE kit to get. Nice job CMMG! I'll be getting another soon. Thank you for the quality product. Really neat product that produced great results. This is really the way to go! I was very curious, but I read some reviews and they were not BSn about how well this thing works. Its a great capability to have. You dont have one? GET ONE! you will not be disappointed. Lucky Gunner 5 star service. Thanks! I purchased one and ran 450 rounds through my LMT AR15. I did not have a single jam, failure to feed/extract, or failure to fire. It worked 100% as intended. I used roughly 400 federal bulk 36gr hollow points and had no issues. I also tried CCI mini mags, velocitors, and stingers -- none of which seemed to have more kick or muzzle climb than the standard velocity loads. All functioned well and the cheap ammo cycles the bolt smoothly. Since this uses the standard 5.56 barrel, the group size did open up for me. Expect a group size about double that of your standard 5.56 loads. There is almost no felt recoil, but the muzzle jumps up almost as much as 5.56 which is great for training. I bought one of these (same brand) some where else at a higher price and I love it. I have fired more than 600 rounds without a single problem using the high price ammo and the cheap bulk stuff and it fires them all. The mags will fit into your 223 pouches the same as the 223 mags. I would tell everone who has a ar15 to buy this product. A: This conversion kit should work well in your Colt AR-15 style rifle. While checking with the manufacturer of the rifle to verify compatibility is recommended, we have found this kit to fire without issue in Mil Spec AR- 15 rifles. Additionally, some ammo manufacturers have produced .22LR ammo designed for use with this kit as well as 10/22 rifles. Our .22LR ammo page will list some options for you as well.